Arkiv Vilmansa’s signature character Mickiv is back! Or is he…. Because at Designer Con 2018, Mickiv is dead! Yes that’s right, Arkiv has teamed up with VTSS to kill of the Mickey Mouse inspired Mickiv. Produced by VTSS, Mickiv is Dead is a 20cm tall vinyl figure, which includes a blood pool base for displaying the figure. 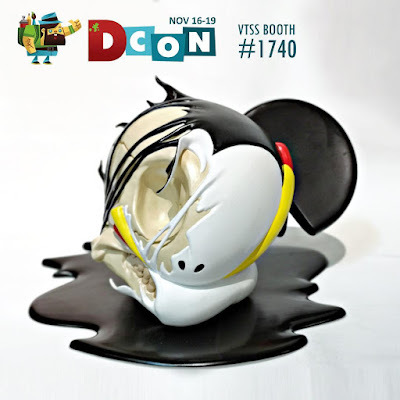 Limited to just 200 pieces, collectors can pre-order this awesome new figure at the VTSS DCon booth #1740 for $180.